Until 1857, Amos Bronson Alcott and his family were always on the move. In 1858, the Alcotts finally settled into Orchard House, their most permanent residence, in Concord, Massachusetts. 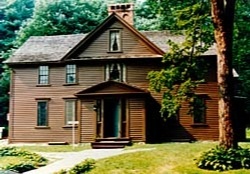 The location of the house put Alcott close to Emerson and Thoreau, and Orchard House is now a celebrated site in Concord. The house, shown here from the street, has been preserved in essentially the condition it was when the Alcotts lived there and now functions as a museum. Alcott's study is on the first floor on the left, and the parlor, or formal gathering room, is on the first floor on the right. The Alcott daughters often used the parlor for their theatrical productions (which Louisa memorialized in her novel). The audience sat in the parlor while the Alcott daughters used the large open doorway between the parlor and dining room as a proscenium arch for their stage. 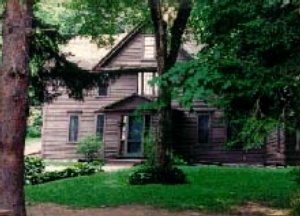 The side view from the left reveals the varied construction of the house. The house was built in three segments that predate the American Revolution. The rear section of the house (left) was built as early as the 1650s and was originally a small L-shaped tenant house known as the Fox House. 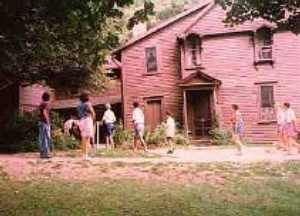 The front section of the house (right) was built in the late 1600s by John Hoar as his home. 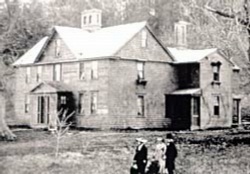 By the time Bronson Alcott purchased the property from John Moore in 1857, both buildings were in a state of disrepair. Rather than tear them down and construct anew, Alcott chose to preserve them. He wrote in his journal on 22 March 1858, "I wish to leave untouched as far as I can the homely affect of the buildings and retain for them the air of antiquity, the picturesqueness which is theirs and in keeping with the past." He split the tenant house into two sections, turned them around, and attached them to the rear and east sides of the main house. Cleverly located above a well, the rear section became a kitchen and today functions as the site's gift shop. Influenced by the ideas of prominent home stylist Andrew Jackson Downing, Alcott immediately added gables and a porch to the front of the home, opened a hall between the two large front parlors, created several artful rounded niches, moved a spiral staircase to the back, built an additional straight staircase where the spiral staircase had been, split the central chimney, and redesigned the chimney tops. He even heightened the downstairs rooms by lowering the floors 18 inches. After the Civil War, he continued renovating the house. He built an art studio on the west side for his youngest daughter, May, and added a small room off his bedchamber, which later became a nursery for his grandsons Fred and John Pratt. The kitchen features many of Bronson Alcott's innovations. The door to the kitchen was set at an angle, so that it automatically closed behind someone entering. It functioned as a time saver and a heat saver in the winter, especially when someone came into the room carrying an armful of firewood for the wood stove. The door seems like a simple enough idea, but apparently Alcott was the first person (in Concord at least) to think of it. Near the cast iron stove, he built a ladder-like clothes drying rack that took advantage of the stove's heat to dry laundry. Also, in the same corner, there is a built-in kettle type of apparatus for heating water. Finally, the kitchen contains a large, luxurious, rectangular soapstone sink which Louisa bought with earnings from her writing for her mother. Louisa had a large, spacious room on the second floor which overlooked the front yard. Today, this room, and all the rooms in the house, still hold furniture and other items that belonged to the Alcott family. Alcott's daughter May decorated the interior walls throughout the house with artwork that is still preserved today under sheets of glass. May's own room is covered in artwork, as is the room she used as her studio.